Following one of the most turbulent Championship Weekends in recent memory, we’ve finally got our Super Bowl 53 line-up set. In what will be arguably the biggest sporting event of the year, the Los Angeles Rams will face the New England Patriots in Atlanta for the right to be called Super Bowl champions. In many ways, it’s a controversial final result, but in others, it provides us with the kind of showdown that is bound to have some fireworks. 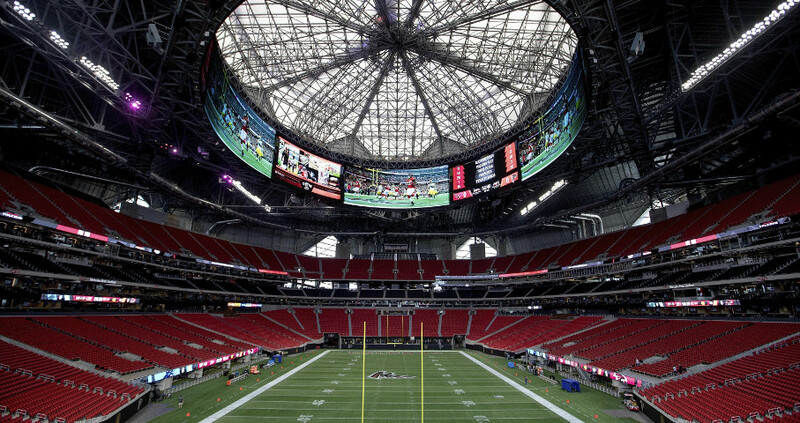 Atlanta’s Mercedez-Benz Stadium, host to the 2019 Bowl. The Rams finally made their return to the big time courtesy of their NFC Championship win over the New Orleans Saints, which received quite a bit of attention courtesy of some missed calls that some believe cost the Saints the game. Nevertheless, this is still going to be a huge moment for the city of LA, as the Rams return to the big time for the first time since facing the Pats themselves in the Super Bowl back in 2001. The Patriots’ win was slightly less controversial, although there are still some fans out there who will do anything to try and bring down the juggernaut that is New England. They defeated the Kansas City Chiefs in overtime to secure their place in Atlanta, which will be their ninth appearance in the SB in the last 18 seasons. This is arguably the biggest sports event of the year. There will undoubtedly be some newer gamblers joining us, so we’re going to do what we can to cater to everyone. First, let’s take a look at all of the “where’s” we should be going to place our wagers. Let’s get a good look at current odds, props, moneylines, all that good stuff, and then we’ll discuss just why they are the way they are. We kick things off with Bovada who have the spread money line in favor of the New England Patriots, although they seem to be fluctuating more so than any other bookmakers. The total is set at 58 which seems fairly reasonable, especially when you consider the kind of games we’ve been treated to in the last few Super Bowls. MyBookie also favors the Patriots, but it’s certainly close. They’ve got the Pats at -2.5 with the Rams trailing as the +2.5 underdogs, with +130 odds on the moneyline for Los Angeles and -150 for New England. Some will find that amusing given the Rams had the better regular season, but this is the Patriots we’re talking about here. The same logic applies for BetOnline, who have the Pats at -2.5 with the Rams at +2.5. The moneyline is slightly different with New England being priced at -140 and LA at +120, which just continues to reaffirm the theory that this could be yet another insanely tight Super Bowl. If you’re looking for a Super Bowl MVP prop then look no further than MyBookie, who have priced Tom Brady as the -110 favorite. Next up comes Jared Goff with odds of +200, followed closely by Todd Gurley at a far away +1200. With a Super Bowl record of 5-3 you’d think that a lot of these odds make sense, but when you consider just how much momentum the Rams have coming into this one, we wouldn’t be surprised at all if they pulled this one off. In fact, we’d actively encourage you to consider the idea. Youth vs experience is always a fascinating contrast in any walk of life, and that’s even more accurate when it comes to Super Bowl 53. Jared Goff, at the age of 24, wants to begin his own dynasty at the expense of Tom Brady who is attempting to continue his. Brady has arguably more options to rely on, but Goff is more than capable of making big plays out of nowhere. Somebody’s going to stomp someone else. Think they’re all ready? On one hand, you’ve got Bill Belichick who is a legend of this game and can coach his way to victory against just about anyone. On the other hand, you’ve got Sean McVay, who is quite comfortably the youngest head coach to reach the Super Bowl. The contrast of styles here is going to be fascinating, as it’s yet another youth vs experience dilemma. Wherever Tom Brady goes, Julian Edelman follows and that dynamic is going to be particularly important in a game where he’ll be coming up against Nickell Robey-Coleman. Coleman is a sensational corner but he’ll need to be at the top of his game against Edelman, who is the definition of a successful modern slot receiver. Todd Gurley had a stinker of a game at the weekend, and it goes without saying that he can’t afford to let the same thing happen twice. Dont’a Hightower is known for shutting down runs with relative ease and if he can sense any nerves on Gurley, then you can bet he’s going to capitalize on it as best as he can. Our final key matchup? Aaron Donald vs the world. 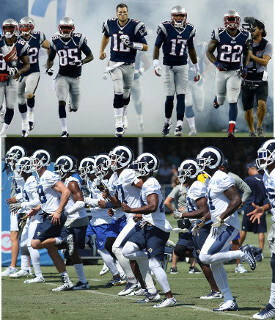 The Patriots will be well aware of the fact that Donald is one of the biggest and best weapons the Rams have in their arsenal, and we’re intrigued to see how New England are going to try and counteract that on the defensive line. Hopefully, this leaves you feeling good about the bets you’re looking to place this Super Event. If you’re still not sure, then maybe we’ve at least given you an idea of where to start doing your research, (we’ve always been big fans of doing your due diligence. Don’t just ‘vote for the cooler looking mascot’). No matter what the outcome of anyone’s personal bankroll, when all is said and done, the Super Bowl is always a great day. Get your nachos and chicken wings ready and enjoy everything the day has to offer. Canadians Watch the Super Bowl. Where Should You Do Your Gaming if You’re in Canada? Betting on NFL Games Live – How? What Types of Bets Can You Make?